For the 2014 elections, I had spent 3 years and my own money to build a team of 100 people to help with Modi’s campaign. Why? Because I trusted that a Modi-led BJP government could end the Congress anti-prosperity programs and put India on a path to prosperity. A Nayi Disha. But four years have gone by without any significant change in policy. India needed that to eliminate the big and hamesha problems of poverty, unemployment and corruption. The Modi-led BJP government followed the same old failed policy of increasing taxes and spending. The ruler changed, but the outcomes have not. The increase in government taxing and spending hurts all of us. The poor suffer the most because they have little to begin with. As someone said, every election becomes an advance auction of stolen goods. So if it hurts us all, the rich and the poor, why do they do it? Because big government means the politicians and bureaucrats become rich. They become rich by taking our hard-earned money. We all pay a very high price for the supposedly free things we get. It’s the same old story that has been going on since the British rule of India: keep increasing taxes and keep enlarging the government. The wealth of those in power grows. Our economic freedom diminishes, and prosperity keeps going further away from us. The government not only taxes us, but it denies us access to our public wealth. As our Dhan Vapasi Wiki shows, every Indian family has a claim to over ₹ 50 lakh of public wealth – locked up in public land, public sector corporations and their assets, and minerals. This means every family should be given back one lakh rupees every year. What gains will we get? First, the hundreds of inefficient and corruption-filled schemes can be ended. That means lower taxes. We all gain. Only the corrupt politicians and bureaucrats will lose. Second, every family’s income will go up by one lakh rupees a year. People will be able to buy more. Economic production and therefore employment will increase. That is why Dhan Vapasi is the path to India’s prosperity, and making every Indian rich and free. As promised, the Dhan Vapasi Bill is ready, and available on our website at DhanVapasi.com. We have sent our Dhan Vapasi Bill to the Prime Minister and every member of parliament, asking them to pass it. But what if they just ignore our demand? We then need to compete with them. Nothing works better in the market and in politics than some tough competition. To put pressure on the current MPs, we have to create competition for them and a new choice for ourselves. So, instead of voting for those who will take away more of our wealth, we can choose to replace the current Lok Sabha with people who will give our wealth back to us. The political parties are not as big as we imagine. The core support of the BJP, for example, is only 15 crore. That’s just 15 percent of the eligible voters. 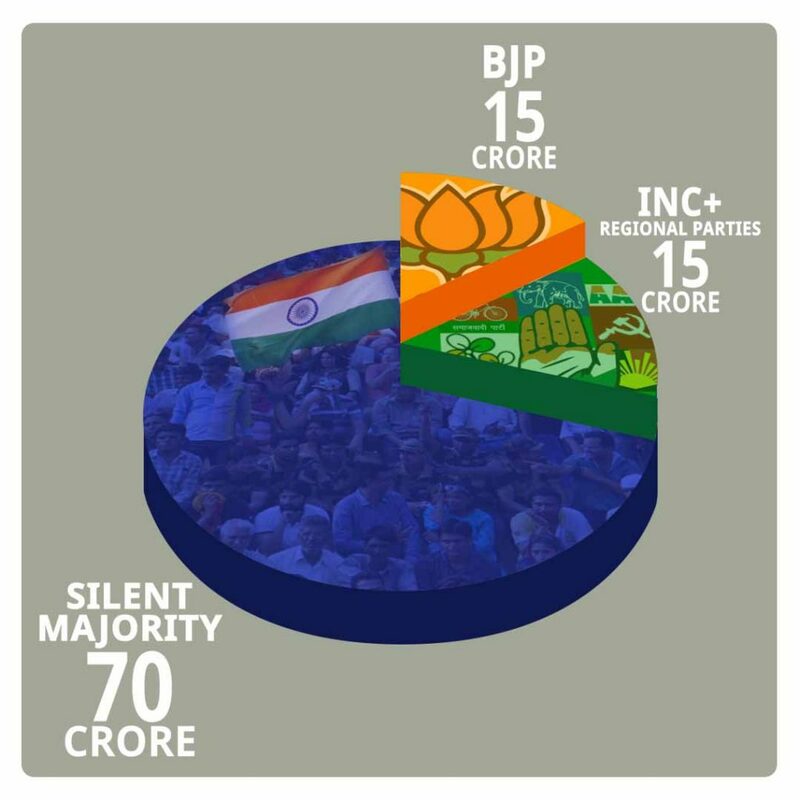 The Congress and other regional parties together are supported by another 15 crore. That means we — those who don’t have a preferred party — are in a majority. There are 70 crore of us. Two of every three eligible voters are like us. We don’t have to vote for any of the standard parties. We can win if we unite and vote for those who will support us, not the political parties. One, make sure we are all registered to vote. Two, vote on election day. Three, do not waste our vote on candidates who have little or no chance of winning. Even if only half of the 70 crore do this, the political parties can be defeated. Dhan Vapasi will happen and India will get a Nayi Disha. I will answer all questions you have. How will we select our candidates? Will we need to make a new political party for this? Can we really elect a majority of MPs in the next Lok Sabha on this basis? I will address those and any other questions you have in my next chat with you. Please do share with your family and friends. Only when we can get many together will we be able to make Dhan Vapasi happen. All my previous Dhan Ki Baat videos are available at DhanVapasi.com.